The Empire State Building is a symbol of many of the best things about New York City. Its owners, the Malkin family, have paved the way to a better understanding of the value of green retrofits. A deep energy retrofit has been an essential part of an extensive renovation that has helped restore this iconic building to Class A status and attract larger tenants. The building is saving tons of energy, and even more importantly the example set by the Malkins has convinced other building owners that deep energy retrofits on older buildings makes economic sense. Surely we can cut the building management a break on the relatively more expenditure of energy involved in lighting the top of the building to celebrate holidays. 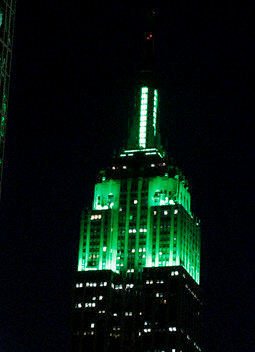 But seeing it swathed in green for Earth Day and having my ears assaulted by over-amped music at the Earth Day celebration at Grand Central Station makes me feel that it would be more ecologically responsible to use a bit less electricity while promoting environmental stewardship.